Have you seen Inside Out, the new animated film from Disney/Pixar, yet? It's so cute! I never would have thought that a movie about feelings could have such a profound impact on people! I have no issue admitting that I cried through most of the movie. I mean - those pigtails on baby Riley? Break my heart already. We talk about feelings a lot in our house anyway, and Inside Out opened more avenues of discussion for that. 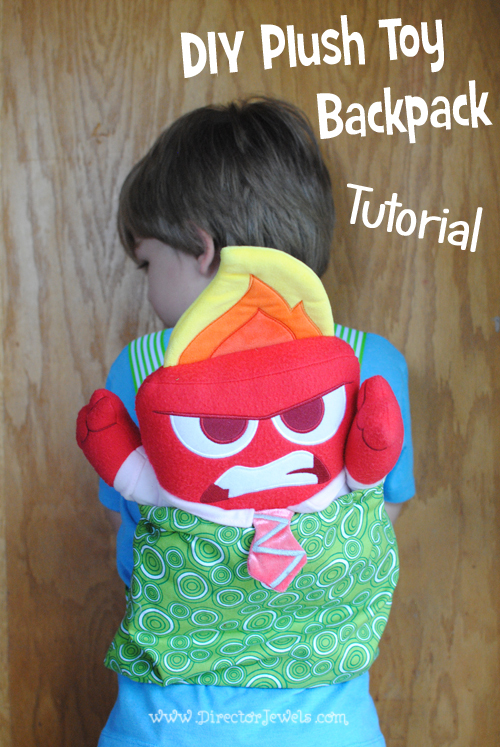 I wanted to come up with a tangible way for the kids to interact with their emotions, so I decided to make a DIY Plush Toy Backpack so that they could carry some emotions along with them wherever they go! 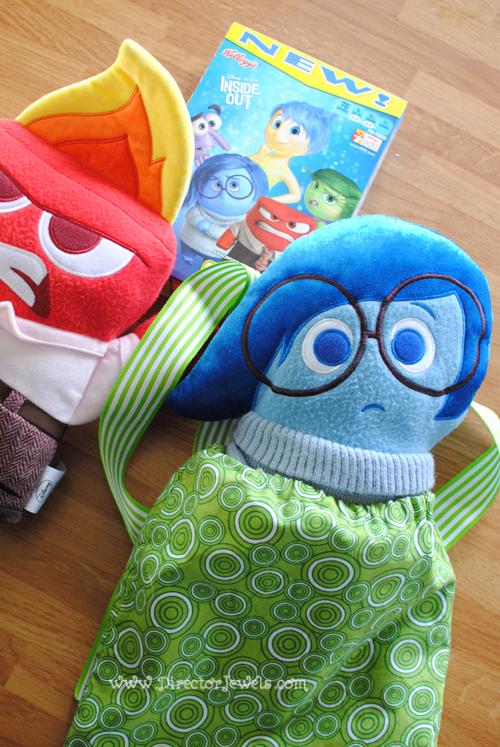 First of all, we had to gather up some emotions to carry in the backpack, so we headed off to Walmart, where we found these adorable exclusive Inside Out plush toys! 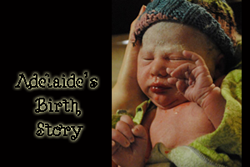 It was quite the debate by Lincoln and Addie on which emotions were the best. They're all so cute! 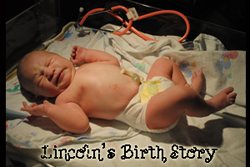 Ultimately, the favorites chosen were Anger (by Lincoln) and Sadness (by Addie). Addie has developed an obsession with "her Sadness" and carts it with her just about everywhere she goes. 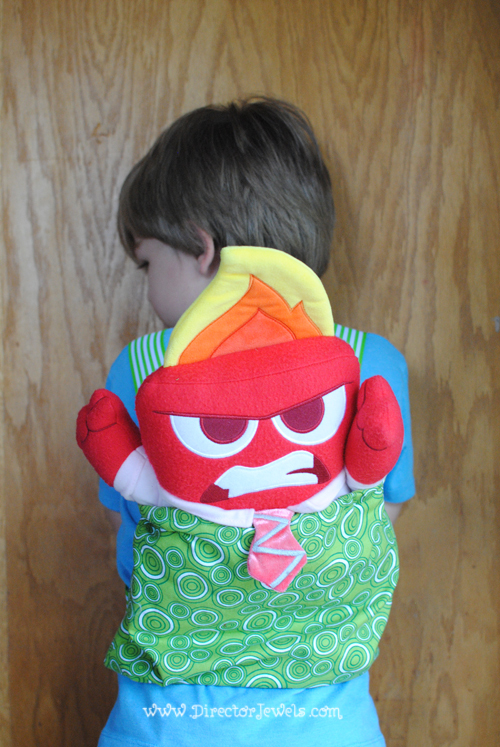 Once we had our emotions in hand, I set out to create a backpack so that they kids could keep their emotions with them at all times! It's a great way to keep them aware of how they always have feelings - and that it's okay to have those feelings! 1. Cut your fabric out. I folded my fabric and cut an 11" square on the fold. 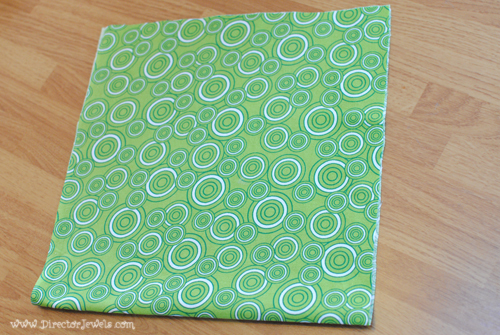 Then I folded the lining and cut a 10x11" piece on the fold. 2. 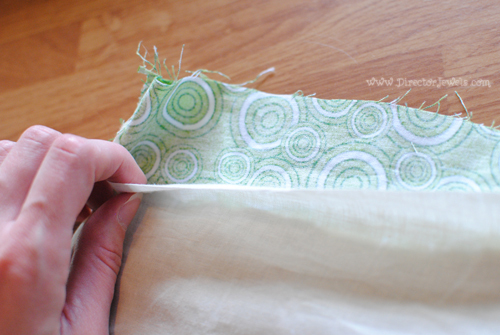 Sew up the sides of each square, leaving the top open. 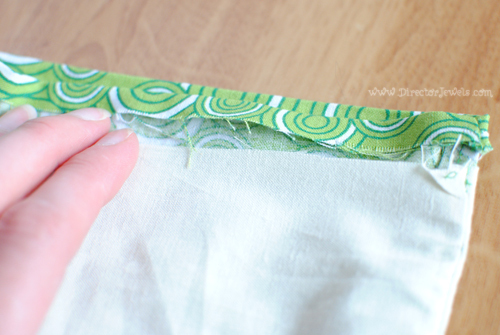 Use a 1/2" seam. 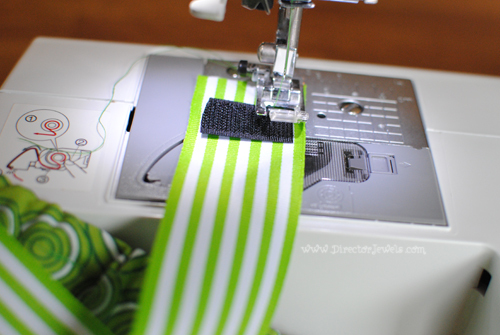 Trim seams. 3. 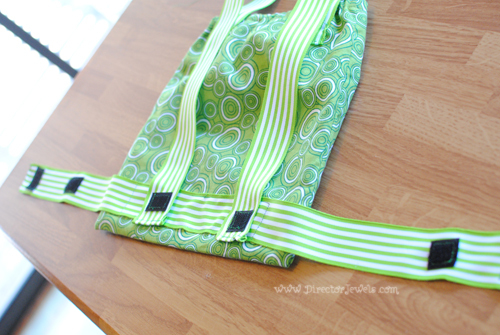 Attach Ribbon Straps to Outer Fabric Pouch. This part was a little tricky. It may have been easier to do this before sewing the edges together, but I opted to wait until it was already done (in other words, I got ahead of myself). I used a 26.5" piece of ribbon for the lower band (which goes around the waist) and two 19" pieces for the shoulder straps. You may have to tweak this based on how you decide to finish the ends (see below) and what size your child is. 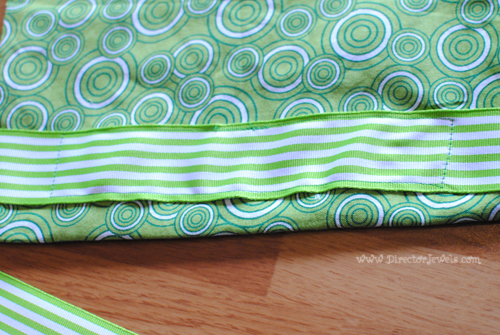 To attach the lower strap, I pinned the ribbon on top of one piece of the pocket and tacked it in place with my machine. It was tough to get the fabric under the needle without bunching or catching the back of the pocket - it may be easier to just hand stitch it. 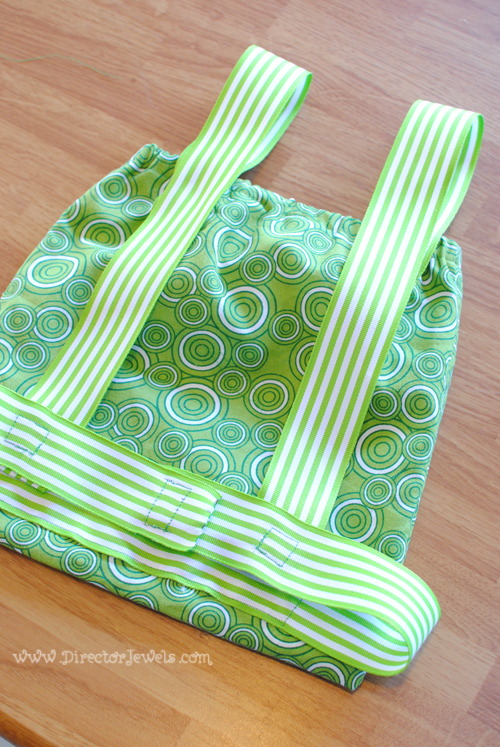 For the shoulder straps, I sewed the ribbon onto the back of the outer fabric pocket about 2-3" below the raw edge. 4. Attach Velcro. I used three sets of velcro pieces - to attach the waistband sides to each other, and each of the shoulder straps to the waistband. I think the photos do a better job of illustrating how I did this than my trying to explain it! 5. 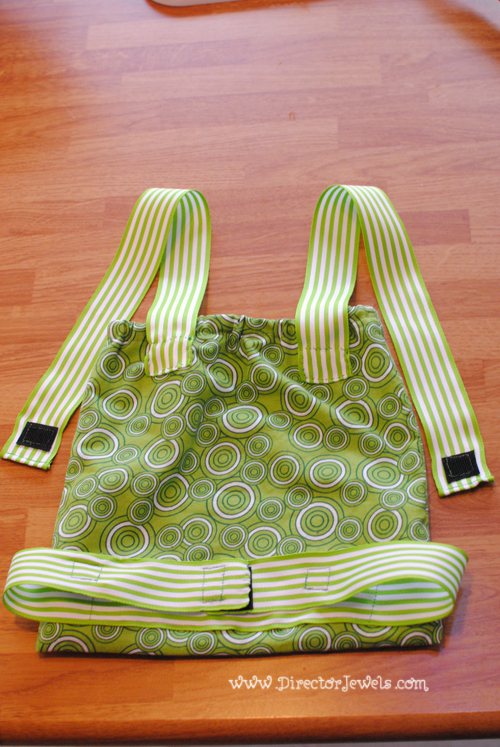 Turn the outer fabric pouch inside out. Insert into the inner (lining) pouch with wrong sides together. Photo above illustrates this. The outer pouch has been cut larger than the inner pouch, so there should be some fabric sticking out of the top. 6. 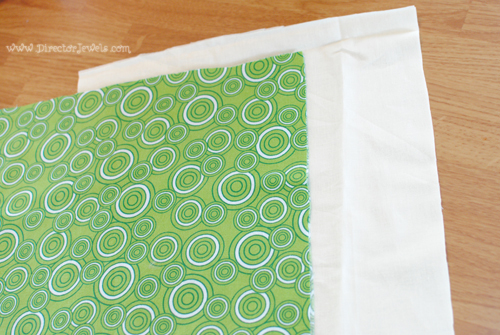 Turn outer fabric under 1/8" and iron. 7. 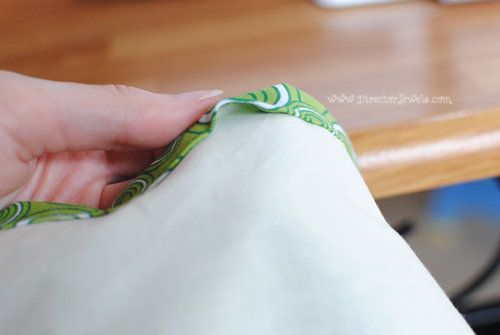 Fold outer fabric over lining and stitch, leaving small opening. 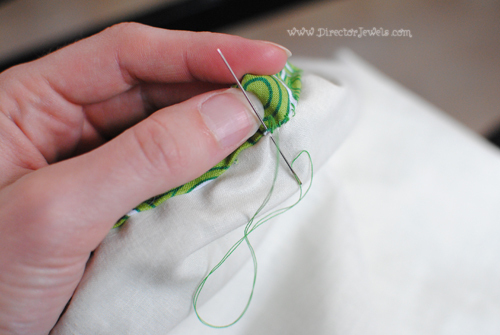 Insert elastic into opening/casing, stitch ends together, then whipstitch opening. 8. 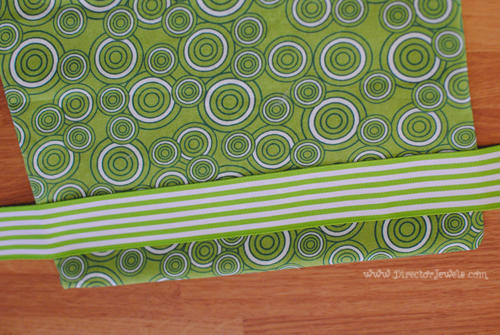 Finish Ribbon Edges. 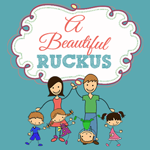 Make sure that the backpack is appropriately sized for your child, then finish the ribbon edges. Maybe it would be easiest to do this before adding the velcro, but that wasn't my method. 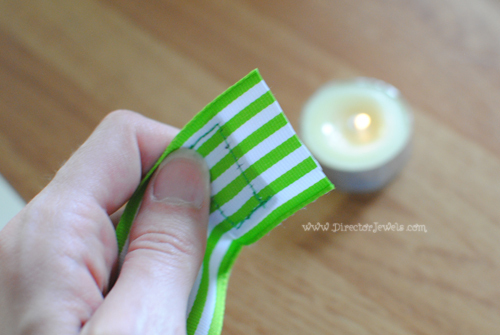 You can fold the ends under and stitch them down, use something like Fray Check, or use a candle to singe the edges of the ribbon. I did a combination of these ideas. And that's it! Make any adjustments needed to the ribbon length before you attach them, okay? You'll thank me later. Better visual of where all the velcro went! The last step is to drop your emotion in and take him or her for a spin! Lincoln showed a wide range of emotions over trying on the backpack, almost the full range of joy, anger, disgust, fear, and sadness. Ultimately, I think he liked it, but I might have asked him to stand for a few too many photos! 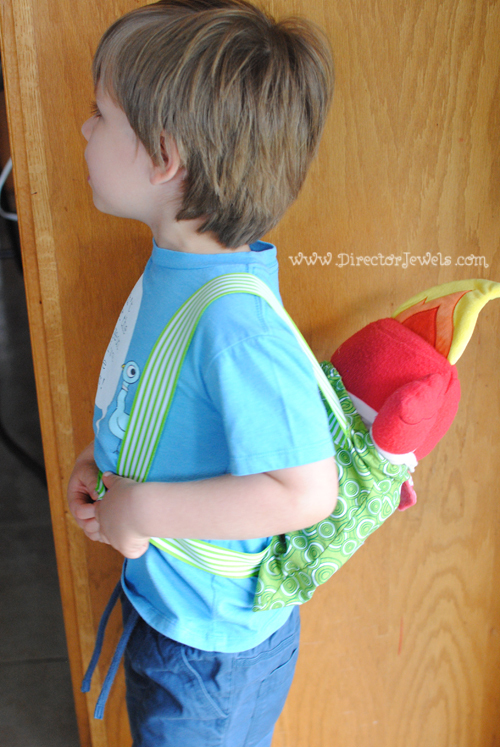 It didn't bother Lincoln, but the ribbon straps tend to ride up on his belly when he is wearing it, making the backpack sag a little. I'll be tweaking the instructions a little when I make Addie's backpack - hopefully I'll find a solution and will update the post if I do! This project took me about two hours to make from start to finish. What emotion would people see on display if you had to carry your feelings around in a backpack like this? Very cute and a great way for them to be carried around!! This is adorable! I really need to invest in a sewing machine and make these for my two smaller children. My sewing machine doesn't get used as often as I intend, but I love having it. This is so cute! Thanks for the step by step instructions. I wanna make this for my twins. That is so cute! I have a little niece who would love this. Thanks so much! I've got to make a couple of these for my son and my daughter. 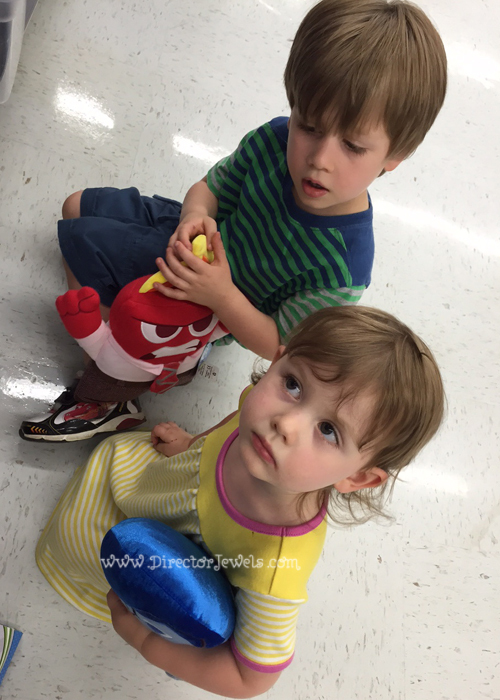 They loved Inside Out and their fanatical about their plushies. My kids are pretty fanatical about the plush toys, too. Oh how cute is that? What a great idea to make your own, it's cheaper and oh my, they are so cute! Thanks! My kids think it's pretty fun. That is so cute! I am not very handy with sewing, but maybe I could make one of these for some kiddos in my life! Oh wow, this is so cool. 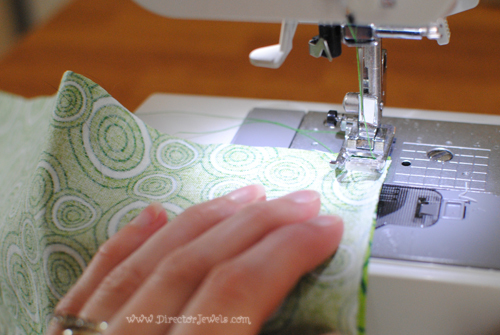 I want a sewing machine so bad. But can't afford one right now. Totally understand! It took a long time for me to get my machine. 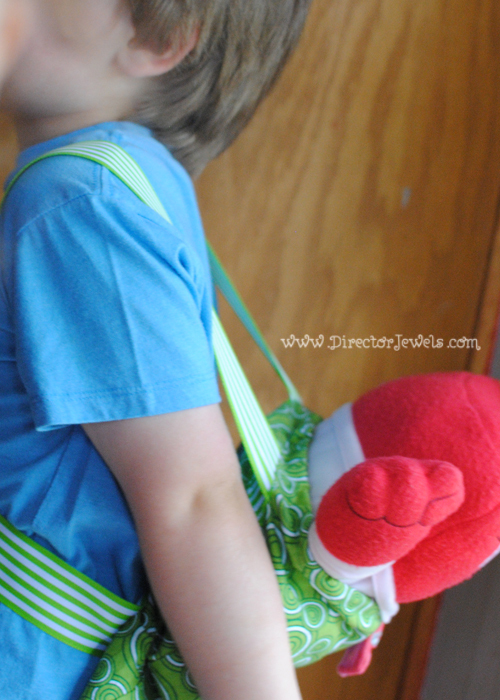 I haven't seen Inside Out yet but this plush backpack looks adorable!! I may need to make something similar for my nieces/nephews!! The movie is adorable! Don't miss it! Those are just so stinkin' creative. What a fun way to tie the movie into your everyday life. Can't wait to see it. It's so cute! I loved it. now this is cool and cute too - my niece would be loving this. It's fun how little kids love carting their toys around with them. I would totally love to make one of these but I can't sew for the life of me! Aww! Sewing is a skill I'm definitely glad to have. Hey Julie, Great Post! 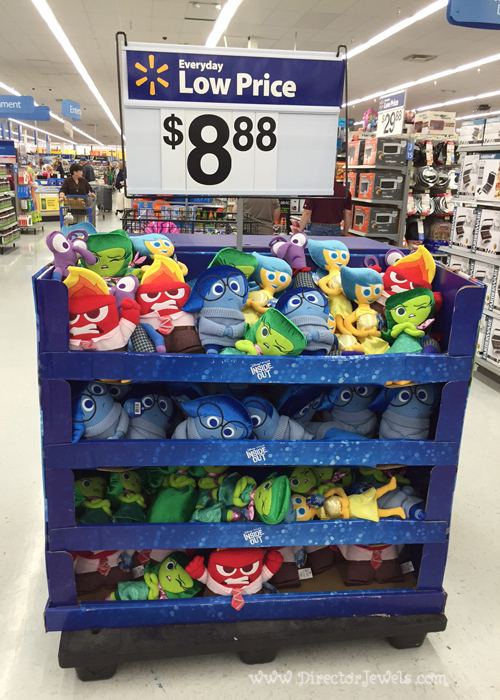 I'd love to know the walmart location where you purchased these awesome plush Toys for 8.88!! 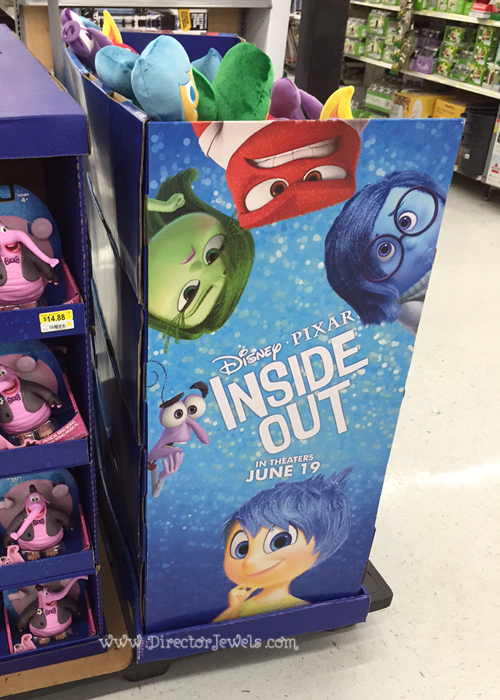 Our walmart doesn't even have any inside out items in stock. I've already visited several Walmart's in our area to no avail. Any help would be appreciated. Thanks! Mine were purchased in Kansas City. Good luck!